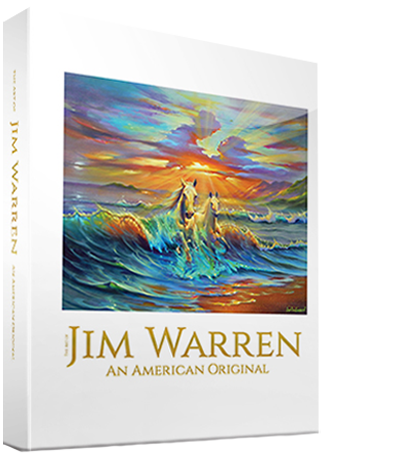 This signed, limited-edition Art of Jim Warren – An American Original book showcases over 195 of Jim’s selected works. Featuring new paintings All Dogs Go To Heaven, Dreaming of Marilyn and Dali By Da Vinci as well as many classics, this is the book to have as a fan of Jim Warren. An in-depth biography of Jim including his inspiration, early awards and growing up in Southern California. A special section of Disney paintings featuring America’s favorite characters through the eyes of Jim. A step-by-step demonstration of Jim’s painting techniques detailed and simple enough for anyone to follow. The Fame Wall featuring stars of stage, T.V. and film as well as Hall of Fame bands including The Beach Boys and Chaka Khan. The Grand Entrance Series featuring classic animated stars.